On the stage of the 46th Genoa Boat Show where the whole panorama of Italian yachting was gathered, superyachts included, we had the opportunity to admire this Canados 116' which was launched in 2006, practically at the same time as the Canados 90' Open, another prized item in the Canados collection which had debuted at the Cannes Festival de la Plaisance less than a month earlier. For information: Canados, Via dell'Idroscalo, 00121 Rome; tel. +39 06 56339732; fax +39 06 56037581; website www.canados.com. 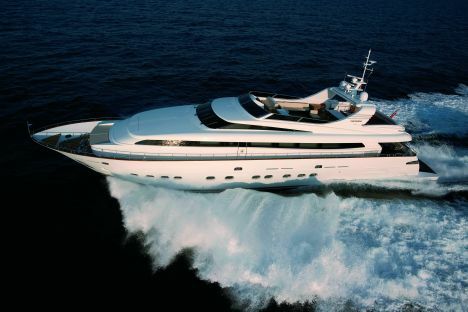 Both the Canados 90' Open, which has introduced the Roman brand into the competitive Open market, and the Canados 116' (latest arrival and new flagship of a successful range of fly motoryachts which has made history in that specific segment) therefore represent, each for her own reasons, a further step in the growth of this Italian shipyard, established in 1945 with the name Cooperativa Navale di Ostia. It was founded by a group of master shipbuilders who came from the river Arno in Tuscany, where they had built boats and seaplanes, and transferred their precious woodworking know-how and hull building mastery to the mouth of the Tiber, where the yard remains to this day. At first in wood and now in composite, Canados vessels - more than 500 motoryachts launched - have always represented the essence of a classy boat, thanks to a design that is never extreme, is well proportioned and more than anything characterised by an elegance of forms that stands up to time. 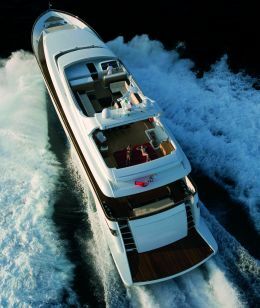 This Canados 116', a custom yacht with planing hull, seems to carry on the tradition. 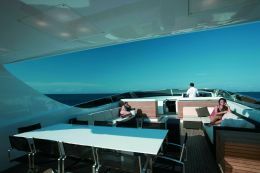 The external design, the work of the yard's technical department, emphasises a fine touch of personality, in line with the stylistic elements expressed in 2004 with the Canados 110'. The rake of the bow is generous, stretched on the water, with the deckhouse rising gently towards the flying bridge, integrating the pilothouse half deck which in turn is well linked with the stern that descends, rounded, to a spacious bathing platform. The side view is further streamlined by the large smoked glass windows alternated with painted surfaces whose continuity, in a play of contrast with the white deckhouse, gives the whole a fairly sporty aspect. 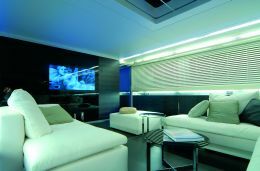 The interiors of the Canados 116' were devised with the precious collaboration of the Salvagli Architetti studio in Rome which drew up an extremely modern project where the spaciousness and brightness of the areas represent the focal points of the whole vessel, creating atmospheres that are always evocative and of great impact. The arrangement of the main deck maintains homogeneity between the outdoor spaces in the cockpit - furnished with a large sofa placed against the transom, a table and armchairs - and the interiors which offer first and foremost a spacious central living area in the saloon and a dining room with a table for ten, positioned forward of the internal stairways leading to the other decks. 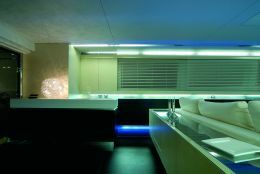 Farther forward is the great Boffi designed galley in steel, equipped with professional accessories and directly linked to the crew's quarters on the lower deck, accessed by a purpose built stairway. The various spaces are linked and rendered homogeneous by their décor - a widespread use of wenge for the floors - and by transparent glass walls that strike the eye evocatively and give an indubitable sensation of space to the whole. 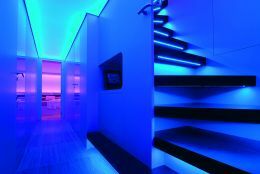 The careful use of natural and artificial lighting is, as we said, a salient feature of the design: a special mixture of light filtering in from outside and artificial lighting that is never direct and is controlled by a home automation system that can create highly evocative atmospheres. 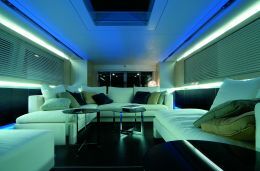 The lower deck, featuring floors in floating bamboo panels, houses the night area which comprises a large VIP cabin, with double bed, and two guest cabins with twin beds. 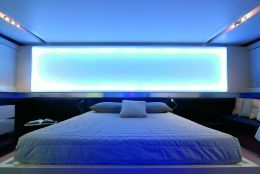 All the cabins have en suite bathroom, beds with backlit headboards and ceilings in Barisol cloth, an extremely light and luminescent material that really strikes the eye. 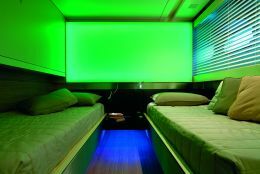 The owner's cabin is aft and takes up the whole width of the beam - therefore very roomy- with a decentralised double bed on the port side, thus leaving space for a big bathroom that runs along the starboard side. 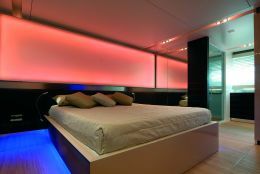 This includes a large shower with Jacuzzi, sauna and chromotherapy, while the sanitary fittings are in a separate room. The comfortable wheelhouse has an exhaustively equipped command bridge and occupies the intermediate half deck, just below the flying bridge which is faced in teak, very spacious and equipped in an analogous manner. Beneath the roll bar with its mast and aerials is the outdoor dining area whose protection from the sun can be extended by means of an electrically operated Bimini top. The top can be extended right to the stern but also forward. Here, next to the external stairway to the cockpit, the deck has a sunbathing area with sun-beds. Farther forward there is a spacious living area with two large L-shaped sofas facing one another and some service furniture. On the starboard side forward, the second command bridge is also very well equipped. The Canados 116' has a large garage at the stern housing a 4.20 metre hydrojet powered Zodiac tender and a jet-ski, both easily manoeuvred, as is the second onboard PWC which is stowed forward in a special retractable compartment in the deckhouse, equipped with a davit. As for performances, the Canados 116' has a maximum speed of 30 knots, supplied by the thrust of two 2.750 HP engines coupled to traditional propeller shafts. 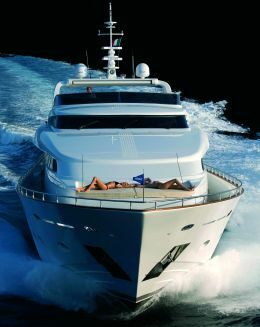 At a cruising speed of 26 knots the vessel has a range of 800 nautical miles.